VonHaus Premium is hardshell, lightweight, modern travel luggage set of three pieces of rolling spinner suitcases. Each one of these bags includes four dual spinner wheels that move easily and smoothly in 360 degrees. You can choose from four color options of red, champagne, teal and grey and they are all equal in price. They are made of sturdy P.E.T- Polyethylene Terephthalate material for hardshell that makes your luggage last longer, withstanding abuse by airport people. They are definitely stronger, more durable and flexible than the regular ABS suitcases to withstand time and the challenges of airport carousel and harsh treatment by staff. 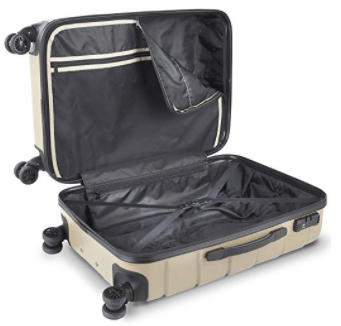 The largest VonHaus Premium suitcase is good for long trips measures 29.5 x 20.5 x 12 inches including the wheels, weighs only 10 pounds and offers a spacious interior of 91-liter capacity to let you fit in a lot of your stuff. The second medium case weighs 2.5 pounds less than the large one and has the dimensions of 26 x 18 x 10 inches with a 55-liter capacity and should be good for roughly one to two-week trips depending on how much stuff you take when you go away. And the cabin bag has a 35-liter capacity, which is still pretty good for a small carry-on luggage that will fit in the overhead compartment on the plane- it measures 22 x 14 x 8.5 inches with the wheels and weighs only 5.5 pounds so you will not go over the hand luggage limit. The built-in TSA lock gives you extra security, it is a cool feature as only the TSA airport staff can get into your suitcase easily and not damaging your lock. Please note that you will get a resettable code for the TSA lock. The double spinner wheels rotate very easily in multiple directions on any ground, especially at the airport terminal or parking lots and pavements. Having eight wheels rather than four give the luggage improved maneuvering capability and they are definitely less of a burden on your arms and your body, with also the ergonomic design telescoping handle that lets you push and pull easily. They also include the padded side and top handles so you can lift them vertically or horizontally, whichever feels more comfortable. In each case, you will find a large D-shaped zipped section with an elastic clip as well, a mesh zip compartment and a small rectangular zip compartment for your toiletries and smaller items. The VonHaus Luggage Set is stylish, versatile, functional and practical, maneuverable, lightweight, sturdy and durable and at a reasonable price. Having three different sizes of small, medium and large gives you options for your different business and esquire trips of different length. We think it is worth paying a little extra than what the standard luggage sets cost, to get something more durable, functional and comfortable such as the VonHaus Premium.